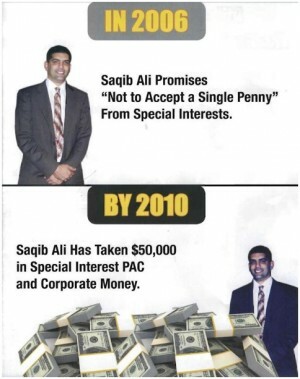 This afternoon, I wrote about a piece of campaign literature from Maryland State Senator Nancy King, which featured a picture of King’s opponent, State Delegate Saqib Ali sporting a noticeably darker complexion. I wondered if the picture had been photoshopped, but the King campaign denied editing the image in any way. It’s plain for anyone to see, if you put them next to each other. It’s very obvious. I don’t know why they did it, it doesn’t make sense. I wouldn’t expect this kind of behavior from any Montgomery County Democrat. I think she owes everyone a real explanation, not just an evasion. Voters should wonder why they are doctoring photos in this way and why she won’t come clean. First off, at no time, in any way whatsoever, did we, or would we, alter photos or attempt to insinuate anything about Delegate Saqib Ali other than the verified facts we have consistently laid out through this campaign — the fact that he fell asleep and missed a crucial vote on education funding, and the fact that he broke his promise to reject special interest funding and then accepted $50,000 in corporate and PAC money. I spy, with my brown eye…some photoshopping. UPDATE: We reached out to both campaigns for their reactions. Here is a statement from the King campaign and here’s a response from Saqib Ali. We’re in the thick of campaign season and while I tend to focus on the Mayoral race or candidates with confusing names here in the District, last night I saw something eye-catching from Maryland, where State Delegate Saqib Ali is challenging State Senator Nancy King to represent the 39th district.